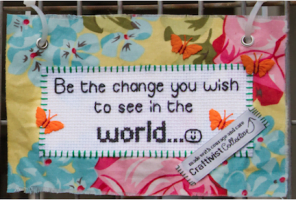 Ever heard of ‘craftivism’? Maybe not. But the chances are you’ll have seen it in action, or even been involved with it yourself. 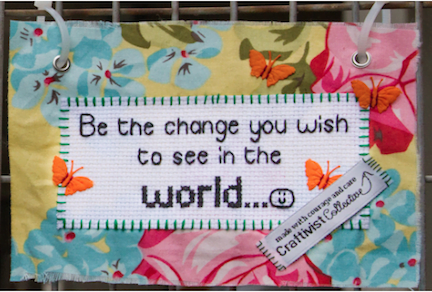 The term craftivism’ was coined by a US crafter called Betsy Greer, who pioneered the idea of using traditional crafts to address issues around society’s need for change. 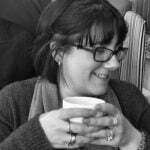 It was picked up in the UK by Sarah Corbett, who at first called herself ‘A Lonely Craftivist’. However, due to burgeoning interest in the idea, her lonely blog has now become a busy website complete with a shop which sells books and kits. This could be crocheting blankets for premature babies or knitting gloves for the homeless. It’s a good group activity and an excellent way to raise the profile of the cause. For example, a troupe of Girl Guides carrying out something like this can both give aid and build awareness in their community just by their actions. Create a piece of work that will address an issue or pose a difficult question. 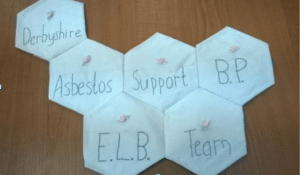 I work for a charity whose primary remit is to provide support to people affected by asbestos disease. Because asbestos was used so widely it still poses a danger to us all – so we also work to raise awareness of this fact. The asbestos cancer Mesothelioma is one of the lesser-known cancers, despite it killing an increasing amount of people. Those left bereaved by asbestos are therefore often keen to tell others about their experience, but giving them the most suitable medium to do this is not always easy. Only the extroverts are happy to talk at conferences and make speeches. But many of those affected lose confidence in their own ability to carry out the most mundane of activities. They feel that they cannot face a world that can deal out such cruelty – where people die simply because of the job that they did. So, when members of our small team found out about craftivism, this seemed like the perfect addition to our campaigning programme. Rather than being out-there and confrontational, it is peaceful and thought provoking. Our project invites those affected to contribute a hexagon to a patchwork. They can decorate this in any way they please – either as a memorial to a lost loved one, or as a comment about asbestos. Those who are not artistically inclined can have a set of initials and a small rose sewn on to their hexagon for them. Sarah Corbett talks about leaving small cross-stitched messages in relevant locations. These invite reflection and thought rather than demand emotional engagement. People often walk past banners and placards and try not to get involved – shutting themselves off from the issue being confronted in such a direct way. But who wouldn’t stop to read a small hand-sewn message? The skill and the imagination involved invites you in. These were most famously used during Fashion Week, when craftivists used their stitched messages to raise awareness of sweat shops and cheap clothing. Our patchwork will be an ever-increasing depository of memories and messages. We can display it anywhere and invite people to talk to us about it. As each hexagon represents a family affected by asbestos, it makes it easier to engage in a discussion. It says a great deal more than any 20-foot high banner calling for ‘Justice for Asbestos Victims’ ever will. World Fair Trade Day. Will you be 'an agent for change'?